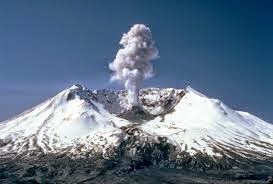 First off: Mount Saint Helena in California is not to be confused with Mount Saint Helens in Washington state. It is composed of volcanic rocks, but St. Helena is much more sedate than her northern cousin. You might even say more ladylike, being composed of rock that's been gently uplifted over the eons, rather than throwing hissy fits like St. Helens did a few decades ago. Located at the convergence of three counties (Sonoma, Napa and Lake), Mt. Saint Helena's multiple peaks can be seen from as far away as San Francisco, 56 miles to the south. 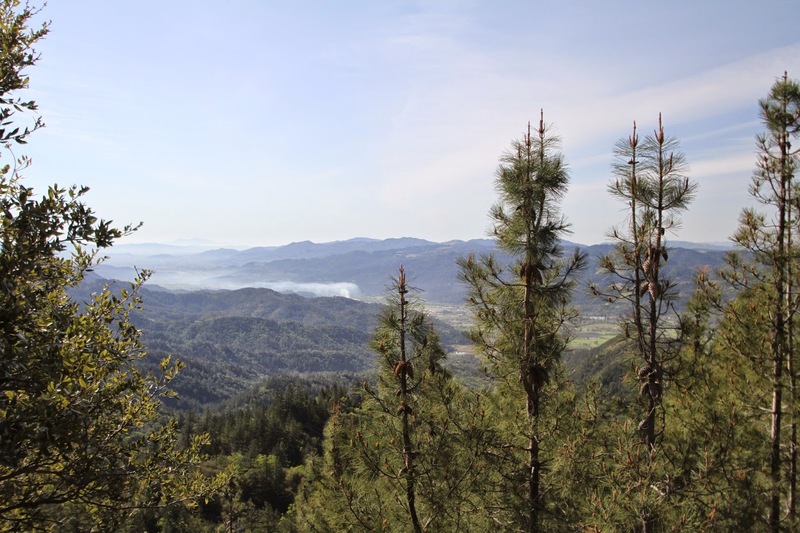 From the top (on a clear day) you can see both the ocean to the west and the Sierras to the east, a distance spanning over 150 miles. From home, it's the first place I've always looked after a particularly cold storm to see if any snow has fallen; I've been known to jump in the car and drive up there just to throw a few snowballs. I know how this sounds to any of you who have just gone through the past winter on the east coast; here in mild Northern California, you take it when and where you can get it. Mark and I took a hike up to the top a few weeks ago, taking advantage of one of the gloriously sunny and warm days we've been having all year. There has to be an up side to being in the middle of a severe drought and hiking in early spring, I have to say, is one of the perks. 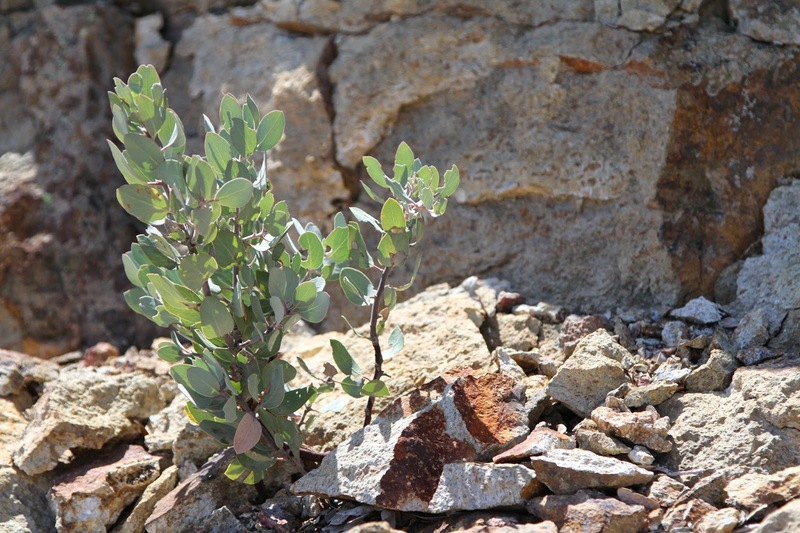 Madrone pokes out of the rocks. All that remains of an old stage stop and Toll House Hotel. Picnic area of Robert Louis Stevenson State Park. This trail is memorable to me for many reasons, but the first and foremost: it was my very first serious hike. I made every foolish mistake on that trip, traveling back several times since to prove I'm not the ignorant buffoon I was in my early twenties. That first hike up was a fiasco. A friend mentioned she was going for a day hike, and would I like to come along? Sure! I said, Sounds fun! I joined her and a few other friends and we drove up to the trailhead. We should have taken heed at the first ominous sign, when we encountered a small rattlesnake curled up smack in the middle of the trail within the first 100 feet. Safely circumventing it, we continued up, gasping from the incline we had not trained for, finally stumbling up to the top many hours later only to turn back around and conduct a (barely) controlled fall back down to the car. Ten miles is a long way when you haven't done much more than walk back and forth from your house to your car in the last year. We failed to bring water and had one orange between the four of us so even if it hadn't been a hot sunny day, it would not have been a pleasant experience. We were a dehydrated mess by the time we reached the car, and barreled down the mountain to the nearest 7-11, sucking down Big Gulps and potato chips as fast as we could. Since then I've learned my lesson. On this hike we had four liters of water with us, along with apples, trail bars, dates and the first aid kit we always have in our pack. We were wearing shorts and t-shirts (it was forecast to be 78 degrees) but had also packed jackets just in case. Opposed to the cheap tennis shoes I had chosen for that first ill-fated hike, this time I was wearing my favorite hiking boots and heavy socks. No blisters for me this time, or ever again. The first mile is shaded and pretty. 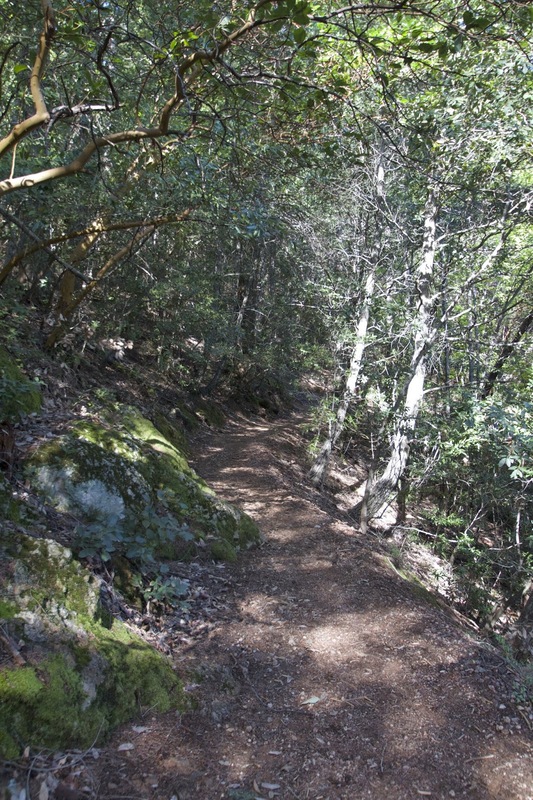 The first mile of trail is a zig-zagging walk up through pines and bay trees. 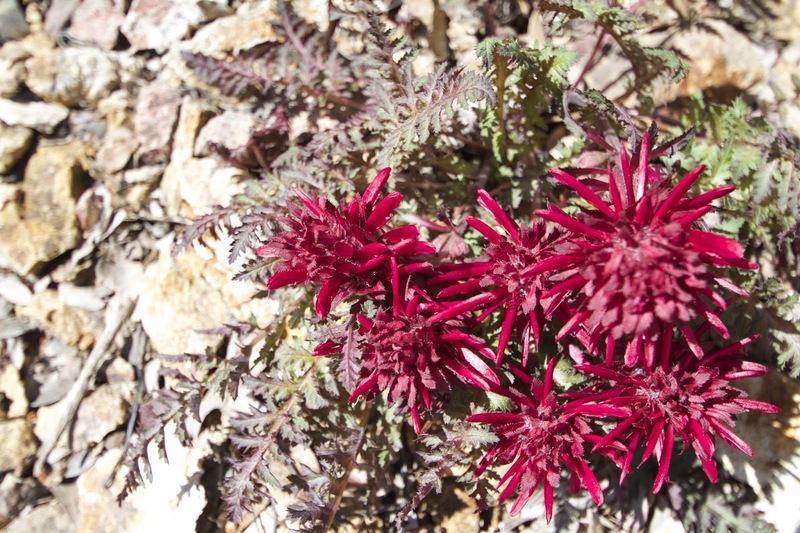 Keep an eye out for the three-lobed leaves of the poison oak plant though; it's prevalent along this trail, especially in the forested sections. 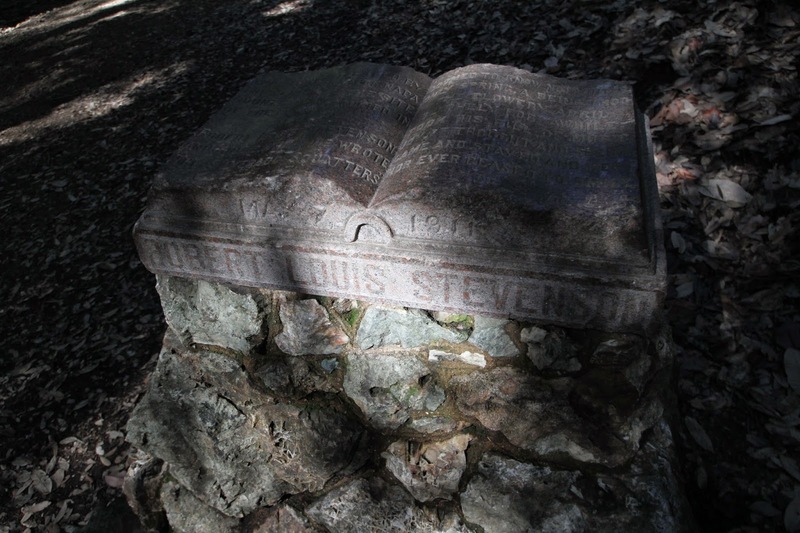 At about the one mile mark you'll see a curious granite marker shaped like an open book: this is where the newly married Stevenson's cabin was located. 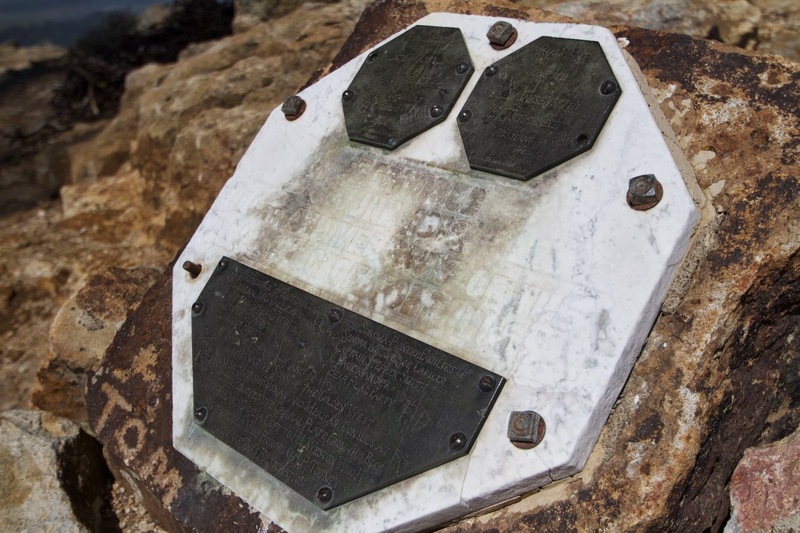 Look to the right of this marker and you'll see faint steps carved into the rock; this is the trail that leads to the fire road that will, in turn, lead to the peak. 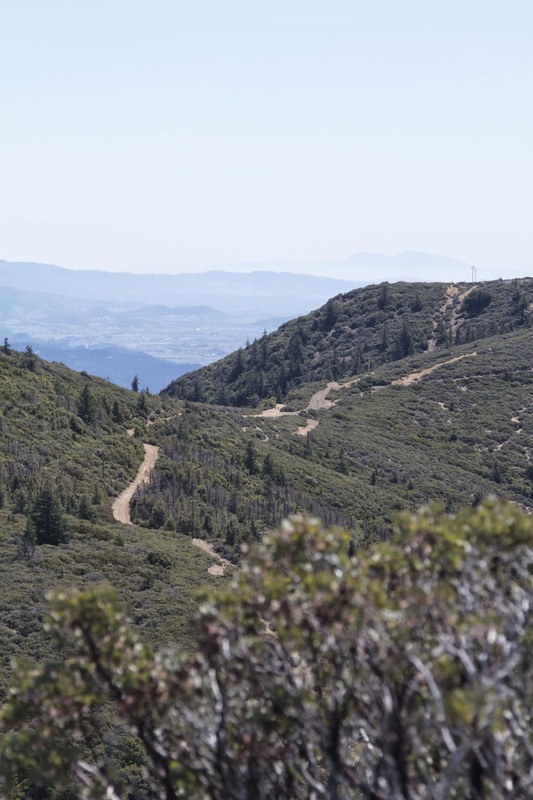 Where the trail meets the fire road. 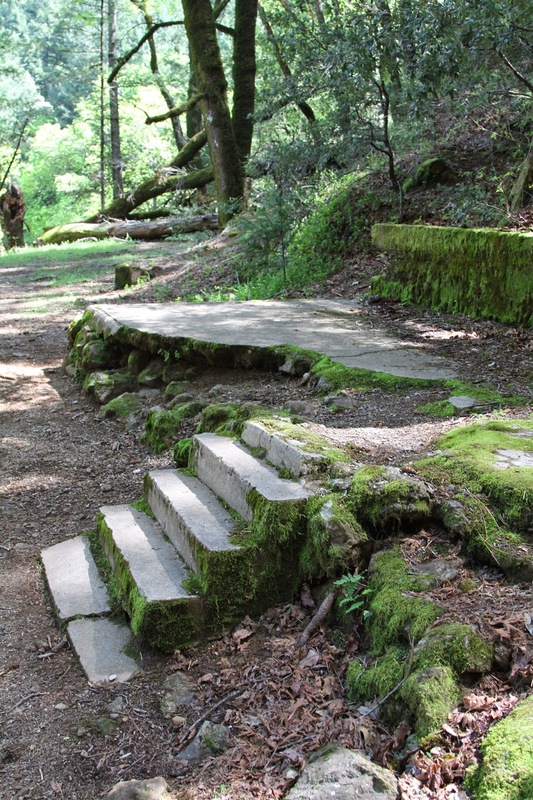 Once out on the fire road, the trail itself is not all that glamorous. The road is there for dual purposes: fire protection is of course a concern, but I suspect it is more heavily traveled by the technicians in charge of maintaining the many many (did I say many?) 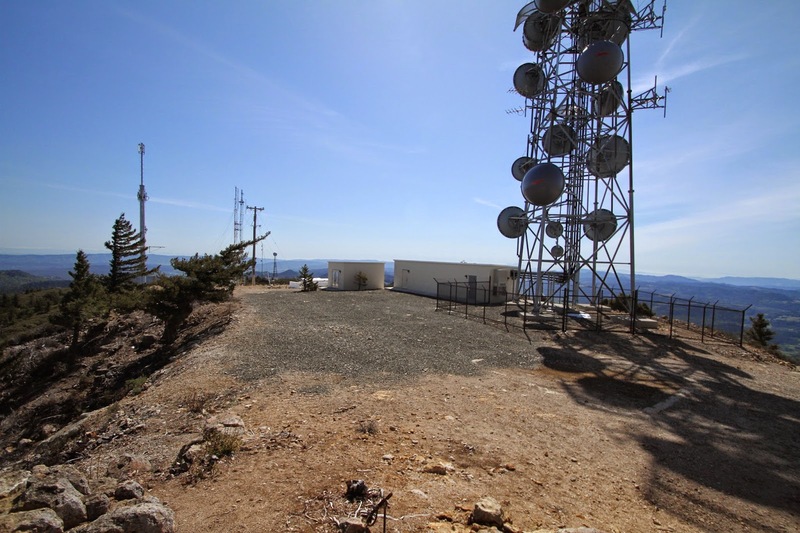 microwave, cell phone and radio transmitter towers on both the north and south peaks. It's really the view that makes this trail worth the climb. 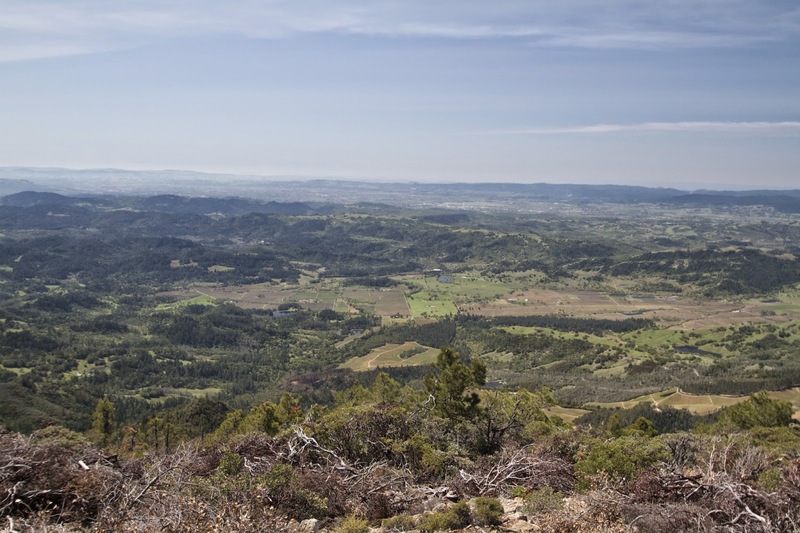 The trees of the bottom portion of the trail give way to shorter madrone and scrubby bushes, opening up a vista of vineyards, lakes and mountains and--if you luck out--the San Francisco skyline, the Sierras and the ocean in the distance. The first view from the road. A farmer was burning that day down in the valley. 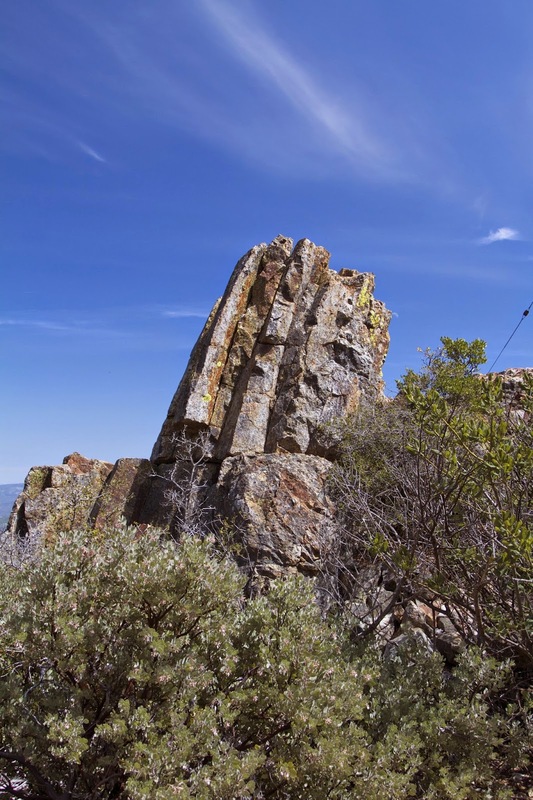 At about the two mile mark there is an outcropping of volcanic rock known locally as "The Bubbles." 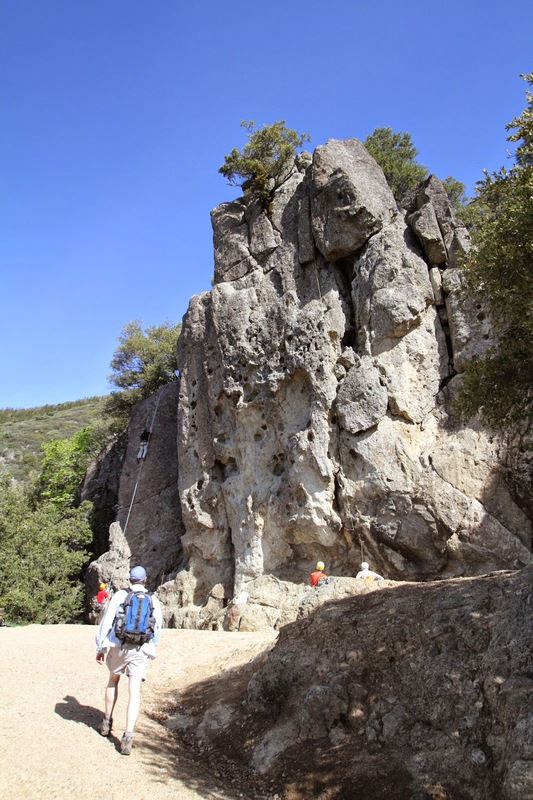 It's a popular spot for rock climbers to practice their skills. We stopped and watched a few climbers for a bit before continuing on our way. At about mile four, the road splits off; go to the left to reach the lower south peak, continue straight to get to the highest (northern-most) peak. 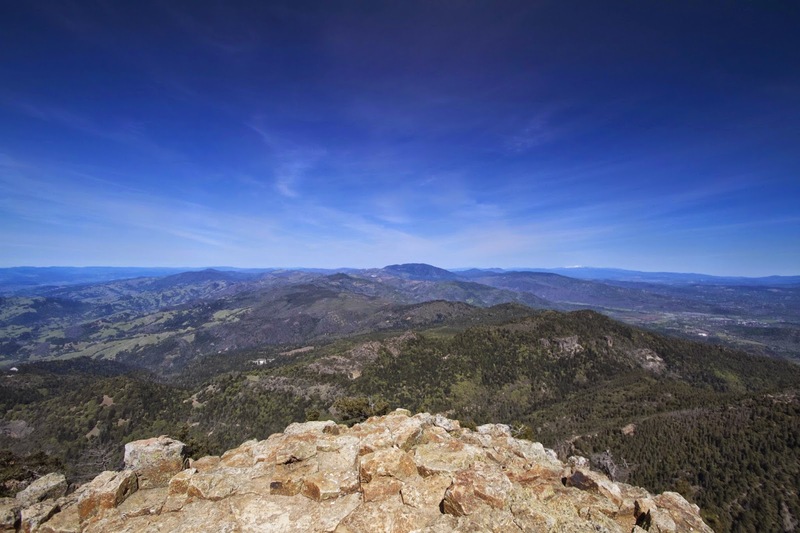 If you choose the north peak (and why wouldn't you? why go all this way and miss out on the bragging rights?) you'll go downhill a ways into the saddle that straddles the two highest peaks. I think this is my favorite part of the trail: I like the view of both peaks on either side, with the open expanse of the valley below. A sign that the "Fire Road" is more for maintenance. "Hey dumb dumb! You bring me gum gum?" 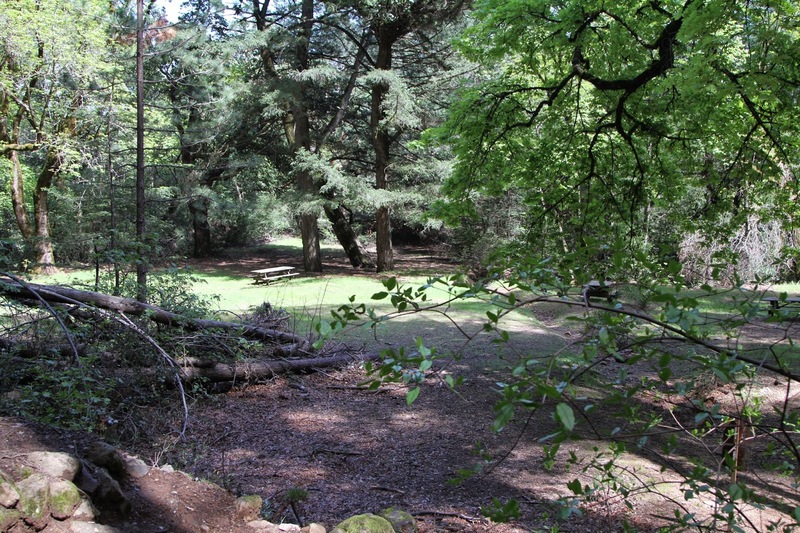 There's a nice little stretch of forest right before you round the corner for the final ascent. In this spot we found some snow on the side of the road, a remnant from the pitiful storm we had a few weeks before. It was fun to be reminded that it was still early spring, despite the warm weather and clear skies. The saddle between the peaks. 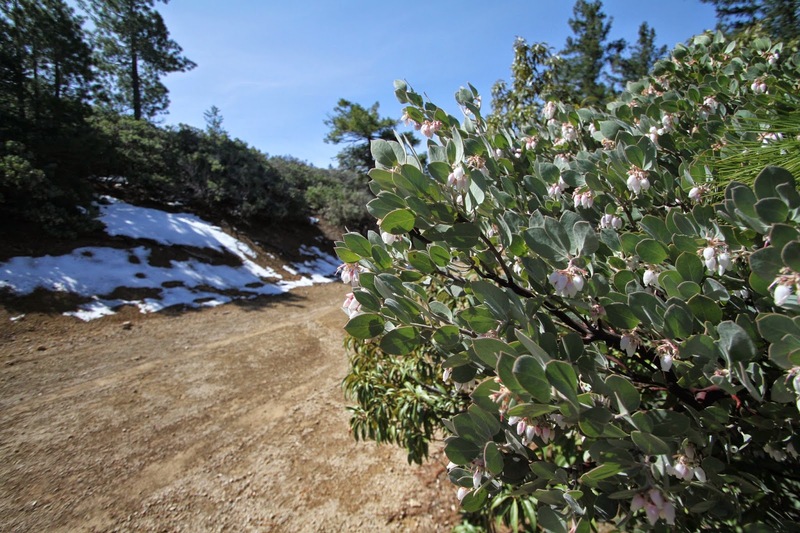 A few blooms and what passes for snowfall in our dry year. The view to the south. Isn't it lovely? The plaque. It's hard to read, even though it's been replaced at least once. 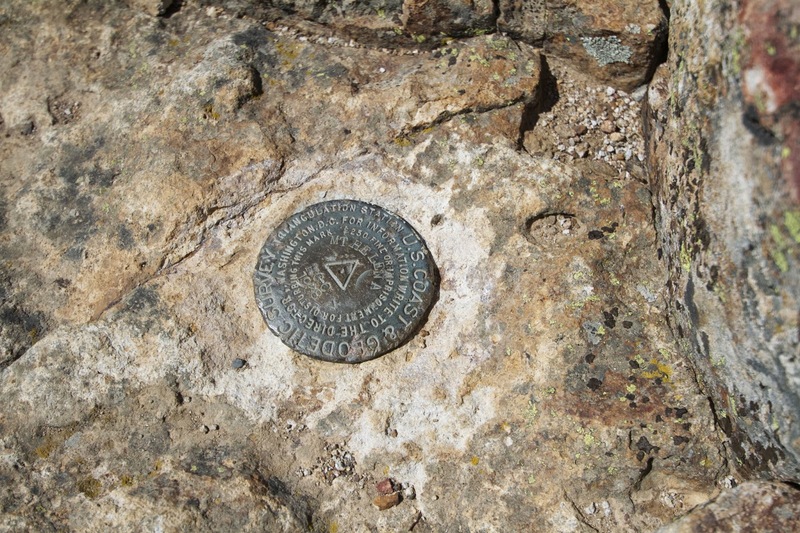 The USGS marker. Mt. St. Helena's height is 4,342 ft. 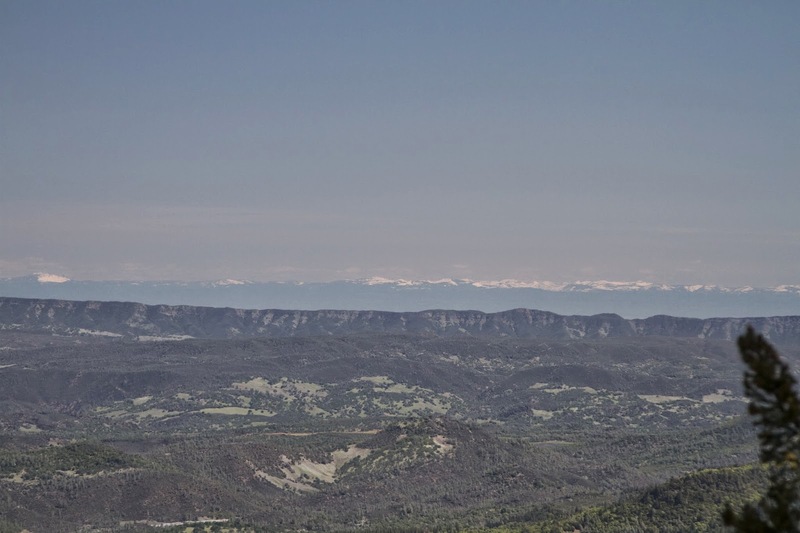 The snow capped Sierras are lined up to the east, 130 miles away. 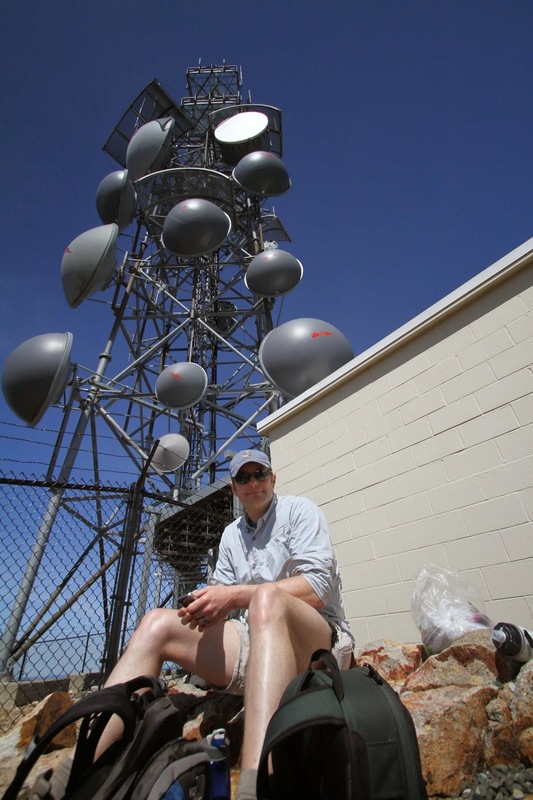 One thing about being out on an exposed mountain in the spring: the wind can be brutal. They weren't the strongest gusts we've ever experienced (Death Valley in the springtime anyone?) but irritating to try to eat lunch with. That's where those outbuildings actually came in handy; we found a comfortable rock on the lee side of the electrical shed and were able to eat without having our granola bars fly into the next county. We spent about half an hour up there, taking pictures, watching all the lizards sunning themselves, and taking in the marvelous view. and out towards the coast. 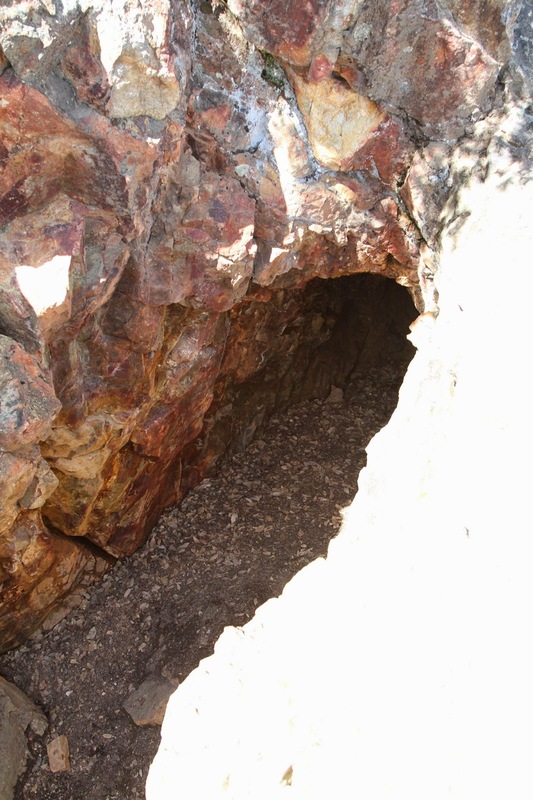 We retraced our steps on the way down, taking a spur trail off to see an old mine shaft on the side of the mountain. You have to keep a sharp eye out for the turnoff to the trailhead; it's not well marked. In fact, the only marking was a gap in the bushes and a rusted steel signpost with no sign (if fell or was taken off I guess.) If you miss the turn and continue down the fire road it eventually meets the highway, but a mile or more from where your car is parked. 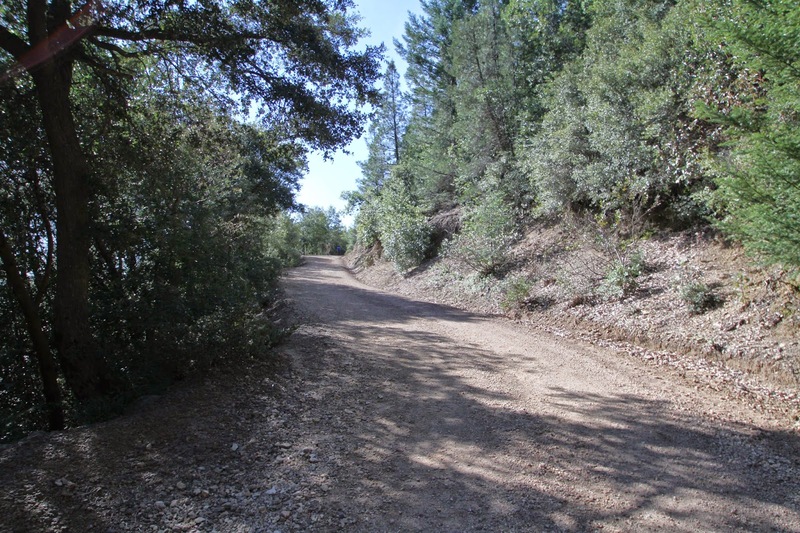 the turnoff to the trailhead on the fire road. The picnic area near the parking lot. Back at the car we saw the parking lot had filled up completely. It was a little surprising because we hadn't really seen that many people on the trail. There are a few other spur trails in the area, and there were a lot of rock climbers in a few places along the way, so that must have accounted for all the vehicles. If you want a spot in the lot, it would be wise to get there before 9:00am. We saw a string of cars parked along the edges of the highway on our way down the road. The highway isn't very wide and is very curvy, so it would be dicey at best to try turning around or parking along the edge. 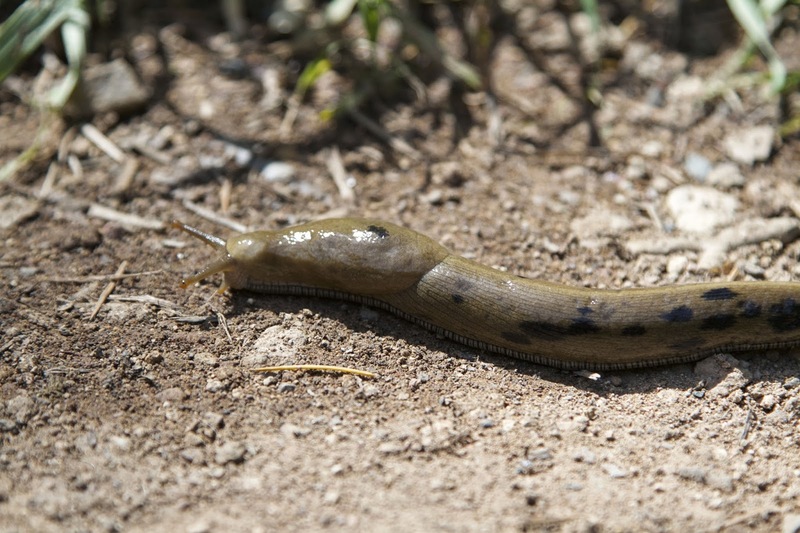 What trip is complete in our neck of the woods without a banana slug sighting? The total roundtrip distance of the trail is a little over ten miles. The grade isn't extreme, so given the time (and water!) most people in moderate shape will be fine. There is no fee for parking or entering the park. 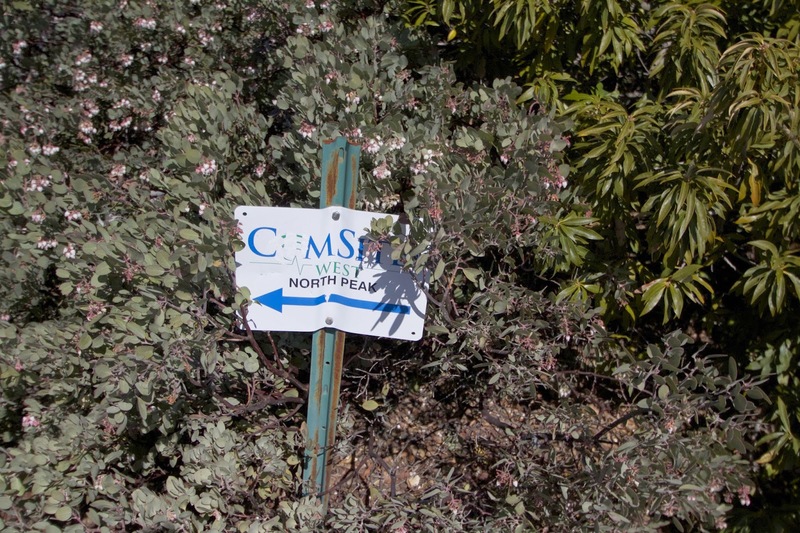 There is, however, added incentive to finish the hike: just down the hill in the town of Calistoga there is a great little ice cream shop called Scoops & Swirls, just what a dusty hiker needs after a day on the trail. I suppose you could go wine tasting or take one of those fancy mud baths Calistoga is famous for, but I'm not sure why when you could get a big scoop of mint chip on a sugar cone and sit in the shade people watching. A free hike and a cone for $3.50; pretty good deal if you ask me. 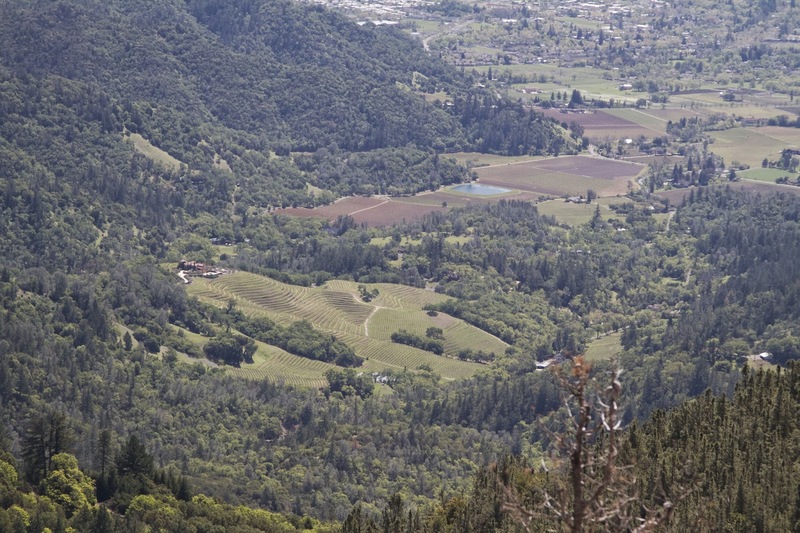 Looking southwest toward the town of Calistoga. 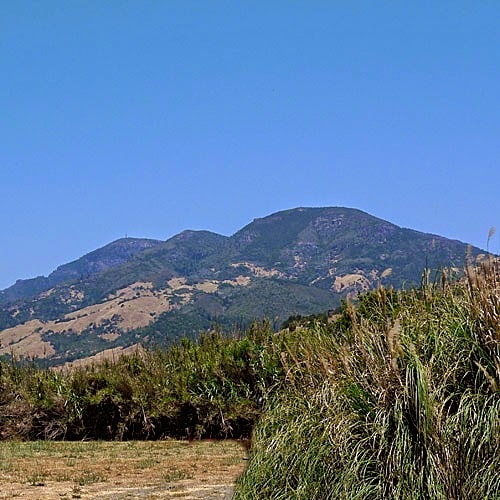 For more information about the Robert Louis Stevenson State Park and Mount St. Helena click here.